Cultural Globalization: Could Abu Dhabi Become the New Paris? A few weeks ago I wrote about Mona Hatoum’s tribute exhibition at Tate Modern, London. This particular piece is sensitively related to how an immigrant and refugee managed to break into a cultural scene that could seem enclosed and restricted only to Western artists. When we think about globalization, we must understand that it affects us in many ways. One of them is cultural expansion. People travel longer distances with less effort nowadays, and decide to immigrate more often, carrying a large baggage full of customs, language influences, and cultural habits with them. Technology also spreads very quickly, connecting more and more people each day. As ethnic and national populations move around the globe, they establish emotional ties with their places of origin. Artists in particular express their emotional longing, admiration, and sometimes worship of their mother lands in pieces of art that become part of their new country’s cultural heritage. Shirin Neshat , Rebellious Silence (1994). B&W RC print & ink, photo by Cynthia Preston. Copyright Shirin Neshat. Courtesy Gladstone Gallery, New York and Brussels. Contemporary Middle Eastern art, for instance, seems to provide answers to all the questions that the rest of the world has about this region’s traditions and cultural background. It is a silent voice that leaves a perpetual echo, one that sings the chorus of a struggle and of tortured beauty. There can be no discrimination in the space of art. A painting, a photograph, a sculpture or an installation remain anonymous for the viewer during the first few minutes of interaction. The name of the artist comes as a revelation. The level of admiration increases, the act of understanding intensifies, and finally an interest has been planted for a long time in the brain and heart of the art lover. In today’s context, Abu Dhabi is expected to finalize works on its own branches of the Guggenheim and Louvre museums, which will shift the interest of the world from this distant city’s extravagant architecture and lifestyle, to its status as one of the world’s capitals for contemporary art. Abu Dhabi is not the first capital to host both Middle Eastern and global art in an environment that unfortunately is not usually linked to the idea of globalization. For instance, Beirut, the capital of Lebanon, experienced a renaissance of sorts in the mid-20th century. Following World War II, the city became a tourist destination and a financial center. It was even nicknamed “the Paris of the Middle East” thanks to its French influences and vibrant cultural and intellectual life. Architect Galal Mahmoud said about Beirut that its history is encompassed in the history of the world, as it includes layers of Roman, Ottoman, Persian and Phoenician influences. Today, Beirut is a place where you can constantly navigate between different minorities and their cultural backgrounds; it is a place where you learn to be more tolerant and open, where you must respect people from a variety of beliefs and backgrounds. It pretty much sounds like Paris today, or London, or New York. Saadiyat Island, Abu Dhabi. Photo: louvreabudhabi.ae. Now, could Abu Dhabi offer the same vibe? Will the opening of these two monster houses of art attract only the nouveaux riches, or also well-educated and art-thirsty tourists? With a long history of influences (first Iranian in the 1900s, followed by Asian and European in the 1950s and 1960s), just like most of the big capitals of the world, Abu Dhabi is a place that can host most, if not all, the Middle Eastern art outbreaks. Louvre Abu Dhabi. Source: ambafrance-eau.org. “Someday, my paintings will be hanging in the Louvre”, van Gogh once said. A museum does not need further introduction. Abu Dhabi is preparing to open the doors to their very own Louvre -possibly in 2017-, a project that consists on building an island inside an island. The architect, Jean Nouvel, wants the museum to belong completely to the culture, history, geography and climate of Abu Dhabi. He has envisioned a place that people would want visit and revisit. As in most Arab cities, there will be a strong contrast between the temperature outside and inside of the venue. People will feel good thanks to this, and will want to share the experience with other people there. A medina of art, built with traditional architectural techniques, held together by an impressive modern dome that encompasses the beauty and poetry of light. Guggenheim Abu Dhabi. Image © Gehry Partners. With these two architectural masterpieces, I believe that Abu Dhabi is breaking into the art world in the most elegant way possible. With the work of those Middle Eastern artists that have been moving audiences throughout the world, and with a continuous flow of ideas and cultural influences, the opening of the Guggenheim and Louvre buildings in the island of Abu Dhabi is announcing that the world is yet to be enchanted and pleasantly surprised. Federico Fellini once said that “all art is autobiographical”, and Middle Eastern art is constantly underlining this statement. Globally, we are becoming an entity, we are coming closer and closer, and art has a lot to gain from this beautiful gathering of cultural differences. One day, people will be reading “An Autobiography of Earth’s Cultural Identity”. Bernardí Roig (Palma de Mallorca, 1965) is one of the most important exponents of the current Spanish art scene. I discovered his work in 2013, while visiting the Spanish National Sculpture Museum. Roig’s disturbing white men were placed among Renaissance and Baroque saints and virgins, surprising visitors with their unexpected presence. It was not the first time that the artist had shown his works among those in museums dedicated to other artistic periods. He has even exhibited them inside iconic religious buildings, such as the Cathedral of Burgos. A sculpture by Bernardí Roig at the Museo Nacional de Escultura in Valladolid. Photo: Gerardo López López. This enigmatic intrusion into one of my favourite museums was unforgettable. Therefore, I was very excited to encounter Roig’s works again this summer. In this case the location was Sala Alcalá 31, a very singular exhibition room in the heart of Madrid. This wide, vaulted space built in the 1930s, allows artists and curators to create very interesting and often bold displays. Its unconventional architectural structure, which resembles that of a church, has hosted memorable exhibitions. For instance, Brian Eno presented his 77 Million Paintings there in 2014. In the case of Roig’s recent solo show, Mind Your Head [Cuidado con la cabeza], light was a crucial element. It created the perfect setting for the sculptures, installations, photographs, objects, videos, and drawings on show. All of them were made during the last two decades, and touched upon many aspects of Roig’s artistic vision. The mysterious atmosphere of the rooms was striking. It was mainly due to the harsh lighting coming from the fluorescent tubes of some of the artworks. In addition, the building’s theatrical character and the overwhelming presence of white also contributed to create the impression of walking into a sinister alternative reality. Or a place taken from someone’s troubled imagination. ‘Fauno in love’, 2014. Photo: Guillermo Gumiel. The first artwork that I encountered was ‘Fauno in love’. It introduced one of the main themes of the exhibition: the limits between human and animal. The idea of the metamorphosis is one of Roig’s recurrent themes, and he has explored it in many of his works. An example can be found in ‘Diana and Actaeon’, a twisted rendition of the classical myth featured in Ovid’s Metamorphoses. ‘Diana and Actaeon’, 2005. Image courtesy of Galería Max Estrella. One of my favorite pieces was an installation inspired by Thomas Bernhard’s short story Der Italiener. A life-sized sculpture of a dead ox hanging from the ceiling was its main component. In Roig’s interpretation of this subject, which Rembrandt depicted centuries ago, the animal’s insides are transformed into artificial light. Nearby, a tv monitor showing a clip from an 1971 experimental film based on Bernhard’s work completed the display. Left: ‘GERMANIA’, 2015. Right: ‘Der Italiener (the ox)’, 2011. Besides the spectacular installations, which definitely make an impression, I was particularly drawn to the series ‘POETS‘. In these drawings, Roig portrays different figures from the Spanish artistic sphere. They all appear dressed in the same austere white robe, with the word “poet” written on it. Their faces, barely recognisable, are distorted by the artist’s strokes. Last year, Galería Max Estrella exhibited the photographs that preceded this series within the framework of the PHotoEspaña festival. As curator Fernando Castro Flórez pointed out, the exhibition Mind Your Head acted as a warning: be careful when entering your own mind, as what you see may be difficult to recount. After such an intense and unique experience, I cannot wait to submerge myself again into the fascinating visions that constitute Roig’s obsessions. If you happen to be in Argentina this summer, do not miss Roig’s exhibition at MUNTREF, in Buenos Aires. To know more about the artist, I recommend watching this interview. A virtual tour of Bernardí Roig’s exhibition Mind Your Head is available here. You have been warned! Earlier this year Ai Weiwei released his new project in Berlin which involved wrapping the columns of the Konzerthaus in 14,000 salvaged refugee life jackets to raise awareness of the plight of displaced people all over the world. With life jackets taken from those who arrived on the Greek Island of Lesbos after facing the dangers of the treacherous Mediterranean sea, Weiwei has created a piece that both the world and Berlin cannot ignore. The sheer scale of the installation highlights the sheer amount of suffering that these people face and as the blaring orange of the lifejackets has captured the attention of the world, we can only hope that these people will try to do something to change the situation of those in need. Through his actions, it is clear to see that Weiwei is a hugely important figure in showcasing that art is political and that it is not merely an aesthetic form. Art is not shallow or meaningless and when it is put into the hands of someone like Ai Weiwei it can bring political issues to a range of people. Weiwei himself is no stranger to political turmoil and disruption with it featuring throughout his life from being beaten by police officials to being held in jail for extended amounts of time with no official charges. Both Weiwei’s life and career has been shaped by political authority who have not only impinged on his right to freedom but on his creativity as well with the demolition of his studio in 2011 by officials showing how this is an artist who knows how it feels to persecuted. Weiwei has suffered at the hands of tyrannical regimes just like the ones that refugees are fleeing from everyday and therefore there is an affinity between the artist and the people who provide inspiration for his work, there is a shared suffering between the creator and the subject. Interestingly, the artist has not only chosen to explore these important issues through large scale projects, he is also utilising platforms within the social media world and particularly through Instagram. The artist posts videos and photographs documenting his time spent with refugees which includes anything from images of the people he encounters to the conditions they have to live with. These digital expressions act as a juxtaposition from the work people usually associated with Weiwei but they relay instant and important messages. Through this platform, the artist can posts daily and continual images that highlight the struggle these people are facing, meaning that the issue can never fade out of sight. It would be impossible for Weiwei to erect one of his large scale sculptures everyday or have an exhibition in every city in the world, but through the Internet he can spread his political and artistic message and people are able to interact with it almost instantly with Weiwei’s Instagram page having over two hundred thousand followers. You don’t need to be an art buff to recognise and acknowledge the suffering that the people in these images are facing and therefore by utilising social media, the artist can speak to a brand new audience and spread the message of their plight even further. The refugee crisis is important and it should not be ignored, and with figures like Weiwei the world is waking up and the permeation of this political crisis into the world of art shows that this issue cannot and should not be ignored. Throughout history, art has been there to express some of the most important moments that define the world that we live in and I think Weiwei’s work is no exception. Art and culture can hold so much power and through these sculptures, photographs and videos, this power is being harnessed and I believe it can go a lot further. Ai Weiwei is an artist who has taken on both his own suffering and the suffering of others and has managed to take a stand through his work, and if you enjoy Weiwei’s piece perhaps you should consider stepping up and trying to make a difference too. 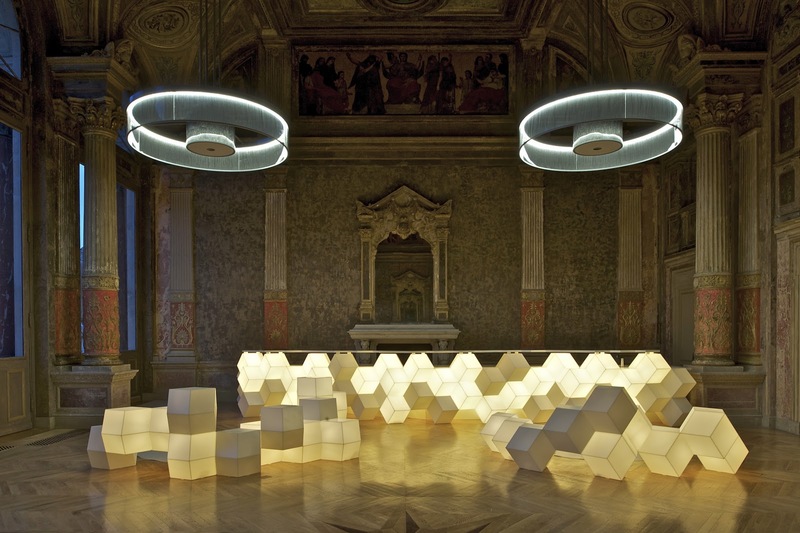 What happens when you light a pompous baroque room with yellow mono-frequency light? Or when you look at 18th century plastering through colorful kaleidoscopes? Olafur Eliasson asks and answers these questions in his current exhibition at the Winter Palace in Vienna, where the Belvedere shows a significant selection of the Danish-Icelandic artist’s works. The former city residence of Prince Eugene of Savoy, one of the most successful military commanders in modern European history, the Winter Palace was always an important site during baroque times in Vienna and it is now a place to encounter art in between baroque architecture and a contemporary setting. By putting Eliasson’s work in contrast to the vast interior, two worlds and two epochs collide – the result is more than overwhelming: the visitor is given the chance to be immersed in a world of pure illusion, light and color. The light installation The Organic and Crystalline Description welcomes us in the vestibule, where light occupies the wall, floor and ceiling and creates the feeling of being underwater. On the grand stairway, the Yellow Corridor gives a new approach to reality through mono-frequency light that limits the range of visible color to just yellow and black, sharpening our senses. As Eliasson puts it: “Seeing only one color suggests that there are none at all. Color is dependent on the existence of other colors in order to be understandable.” In the following rooms there are different optical machines and installations, such as Kaleidoscope, New Berlin Sphere and Your Welcomed Reflected, offering an even deeper immersion into the world of perception, transformation and deconstruction of reality. It is fascinating to witness the contrast between old and new and the transformation of old things into new ones depending on contextual surroundings. By always immersing into the works of art and getting a bodily experience, we leave the site with sharpened senses, wondering about the relationship between the body, perception, and images. Everyday habits of seeing and experiencing details are questioned and challenged. The whole show, indeed, has a sheer beauty to itself and bears an aesthetic quality that speaks to the visitor in an exceptional way. On view at the Winter Palace of Prince Eugene of Savoy through March 6th, 2016. Last week was Art Week in Madrid. Although the main event this year was the celebration of the 35 anniversary of ARCO, Spain’s biggest and most famous contemporary art fair, there were so many interesting alternatives (ArtMadrid, JustMad, Room Art Fair, Drawing Room, We Are Fair! and Casa Leibniz) that it was tough to choose among them. I usually find regular commercial fairs quite overwhelming, with their endless corridors and lack of space between stands. So, this year I decided to visit those that promised a different experience: Room Art Fair and Casa Leibniz. Both of them took place inside splendid nineteenth-century buildings located opposite each other in the lively district of Chueca. I was able to visit them in the same day, and was pleasantly surprised by the quality of the works exhibited and the radically different concepts behind them. Room Art Fair put the emphasis on the active role given to the spectator. Each gallery or curatorial project occupied one of the 36 rooms of the Petit Palace Santa Bárbara Hotel, where visitors could find the works of emerging artists from all over Europe, as well as those of the three winners of the New Curators Project. One of these was Texturas Sonoras (Sound Textures), curated by María Castellanos, which consisted on a site specific interactive installation by artist Alberto Valverde. Inside a dark room, a luminescent structure projected onto the ceiling and bed developed in response to the sounds produced by the visitors’ presence. I was mesmerised by the changing patterns that were created by a spectrum of frequencies that our brain ignores, and it was great to talk to both artist and curator about the different environments in which they had recorded ambient sounds resulting in incredibly colourful and intricate images. Photography also had an important presence in many of the rooms. I was particularly drawn to a series titled I called her Lisa-Marie by young French photographer Clémentine Schneidermann, represented by Galerie Huit Arles. Schneidermann explores the legend of Elvis through images of his fans and doubles taken during an annual festival held in his honour in a small town in South Wales, which she combines with photographs of the King’s home in Memphis, Tennessee, blurring the lines between document and fiction in the viewer’s mind. ‘Robbie, Abergavanny, Wales’, 2015. 70 x 70cm. C-Type print. © Clémentine Schneidermann, Courtesy Galerie Huit. Another project involving photography that I found particularly interesting was the one presented by Març Rabal and Kiko Navarro at Galería Artara. Both artists work around the theme of boxing through the lens of gender: Rabal uses collage to create subtle but powerful images in which she merges the bodies and attributes of ballet dancers and male boxers, while Navarro’s black and white photographs situate the viewer inside the world of female boxing, where the contrast between the masculine and the feminine is brought to the surface. Març Rabal and Kiko Navarro, Galería Artara. Perhaps one of the rooms in which the works exhibited were better integrated in the space was the one occupied by Mad is Mad, a local gallery located minutes away from the fair. Assaf Iglesias, Frédérique Bangerter and Berta López, Mad is Mad. Assaf Iglesias and Frédérique Bangerter’s fine drawings and Berta López’s carefully arranged objects and embroidered messages occupy every corner of the room as if they were meant to be there. The dark grey tiles in the bathroom seem particularly fitting for the subtle colours and enigmatic forms in Iglesias’ works. Assaf Iglesias, Mad is Mad. Although the constant flood of people entering and exiting the rooms was a bit stressful and made the experience feel a bit like speed dating, I was very impressed by the way artists transformed the space and made it their own. Walking along the corridors and peeking through open doors accentuated the embarrassing yet exciting feeling of invading people’s privacy over and over. To me, the most interesting aspect about Room Art Fair was the intimate atmosphere created inside the small hotel rooms, which facilitated the interaction between the artists and the general public. Visiting Casa Leibniz was a completely different experience. In its second edition, this small art fair coordinated by Sara G. Arjona brought together 13 galleries and 23 Spanish artists whose works were displayed in the high-ceilinged rooms of the Santa Bárbara palace. The main purpose was to “create an inhabitable space to enjoy, understand and talk about new art”. It felt more like an exhibition than a commercial art fair, which made it easier to connect to the space and the works selected. These were accompanied by a group of 8 panels with texts by contemporary Spanish writers and philosophers, including Félix de Azúa and Chantal Maillard, which were purposely difficult to skim through. Visitors could decide whether or not to stop for a few minutes to read them, but they were meant to be as important as the artworks. From the moment I entered the building, its nineteenth-century architecture and cracking wooden floors made me slow down and forget about the noisy street outside. The experience resembled that of slowly turning the pages of a carefully illustrated book. The rooms were almost empty, giving visitors the chance to move around the artworks and observe them from different perspectives, while the open windows served as blank pages where one could pause and breathe before moving to the next object. Julio Falagán, ‘Way of Escape’. Some of the projects seemed to fit this unique environment particularly well. This was the case with Julio Falagán’s Way Of Escape, an installation composed of several pieces of old landscape paintings. Falagán uses the old to construct a hopeful view of the present, which is nevertheless fragmented and held together by visible threads. He is interested in the sky as the last remaining free space, owned by no one in a world full of borders and restrictions. Rubén Martín de Lucas, ‘Minimal Republics’. Falagán’s work was not the only one to deal with territorial frontiers. Rubén Martín de Lucas’s Minimal Republics, for instance, dealt with the artificial and ephemeral nature of our borders. The artist intervened in three different landscapes and drew three temporary spaces that he inhabited for 24 hours. These experiences were shown through a video installation whose strange power of attraction kept me glued to the screen for a good ten minutes. Ignacio Canales Aracil, ‘Ver a través’. Ignacio Canales Aracil’s Ver a través made visitors literally see the space around them through the fragility of time and nature. It is easy to get trapped in the delicate web of pressed flowers that he uses to create his sculptures, which he has exhibited in several countries including the UK and Australia. In the same room I was drawn to Gloria Martín’s figurative paintings. They were part of her project Réplica, through which the artist establishes links between her hometown, Seville, and Brussels, where she has been working recently. Her images transport us to a different realm where artistic objects from different provenience and cultures can coexist, which was precisely the aim of Casa Leibniz: to create a different time. The longer I stayed inside the Santa Bárbara palace, the more it felt like a refuge from the outside world. Those lucky enough not to be in a hurry could enjoy the incredible experience of letting go of time to give each work and piece of literature the attention it deserved. There are two important events happening in the art world in London both connected to Alexander Calder. The Tate Modern showcases “Alexander Calder: Performing Sculpture” until April 3rd and equally as important is PACE LONDON’s “Calder Prize 2005-2015” show that acquaints visitors with the level of inspiration that this grand artist is still offering young artists from all over the world. At Pace, Alexander Calder’s works such as “Still Life”1944, “Snag” 1944, “Fawn” 1944, “Untitled” 1953, “Trois pics (intermediate maquette)” 1967, “The Tree” 1960 are exhibited in conversation with 6 artists, laureates of the Calder Prize between 2005 and 2015. A Maverick of modernist art, Calder completely revolutionized the landscape of art by insisting on introducing performance and kinetic qualities to sculpture, embracing industrial media including wire and sheet metal. Calder managed to change the most static materials into romantic pieces. This ultimate vanguard of modern art is still continuing to touch the art world by inspiring so many young artists. Nowadays, Calder Prize and Calder Foundation, a non-profit organization, aim to collect, exhibit, preserve and interpret the art and archives of Alexander Calder. The foundation examines works attributed to Calder and catalogues the artist’s works.Together with the Scone Foundation in New York, the Calder Foundation sponsors the biennial Calder Prize, a $50,000 award to a living artist and it also facilitates the donation of the artist’s work to a major public collection. The laureates are also invited to complete a residency in Calder’s atelier in Sache, France. Below is a brief presentation of the artists who have been laureates of the Calder Prize 2005-2015. Darren Bader, born in 1978, in Bridgeport, Connecticut, lives and works in New York. Bader first started by wanting to be a film director and his first videos, composed of long takes of objects, inert and in motion, were a preview of what Bader the artist was going to do. Tara Donovan, was born in 1969, in New York and was awarded the Calder Prize in 2005. Donovan’s work uses everyday manufactured materials such as Scotch tape, Styrofoam cups, paper plates, toothpicks, and drinking straws to create large scale sculptures that often have a biomorphic quality. Her sculptures must be assembled and disassembled carefully, which sometimes involves an extremely tedious process. With regards to her artistic process, Donovan explained that she chooses the material before she decides what can be done with it. She noted in an interview that she thinks “in terms of infinity, of [the materials] expanding.” Her work has been exhibited in numerous important venues such as Corcoran Gallery of Art in Washington, Hammer Museum, University of California, MMOA in New York and many others. She is present at Pace London with “Cloud”, 2003 and “Untitled”, 2015. Rachel Harrison, born in 1966, in New York, was a Calder Prize laureate of the 2011 edition and has had many solo exhibitions at institutions such as Bergen Kunsthall, Camden Arts Centre, San Francisco Museum of Modern Art, Migros Museum fur Gegenwartskunst in Zurich and SMAK, Ghent. She lives and works in New York and is present at the Calder Prize with “Avatar” ,2010 and “Silent Account”, 2004. Rachel produces sculptures that juxtapose a unique combination of found, purchased, and received items. Since then, her works have been fabricated using a wide range of materials, such as honey, cans of peas, papier-mâché, and trash bags. By using everyday goods and objects, Harrison frequently takes on the subject of consumer culture. She also often confronts popular culture and celebrities with her work. In the 2012 exhibition named “The Help”, her pieces featured the singer Amy Winehouse and the artist Martin Kippenberger. Zilvinas Kempinas was born in 1969, in Plunge, Lithuania and he is the Calder laureate of 2007. He lives and works in New York and his works are kinetic and minimalistic. Kempinas employs non traditional materials to create active and dynamic exhibits, most commonly as installations. In many of his works, Kempinas utilizes his signature material, unwound magnetic tape. The use of the tape affects the viewer through various senses; visually, aurally and physically. “His art plays out on the bright side of the moon” and Londoners can see that in his work exhibited at Pace London “Illuminator”. His installation “Flux” shows as much of Calder’s influence and heritage as aimed by the exhibition. Similar to the rest of the laureates, Kempinas has had major solo exhibitions including the ones at PS1 Contemporary Art Centre, Long Island New York, Palais de Tokyo, Paris, Contemporary Art Centre, Vilnius, Kunstalle Wien and many others. Haroon Mirza is an English and London born artist, who became a Calder laureate in 2015. His installations made me think about what famous architect Xavier Corbero said: “when you choose the right scale, music sounds beautiful”. Mirza is close to an architect, creating a space where LED lights, speakers, vinyls, screens, and different music sounds interact and converse to the point of involving the spectator. His installation “Light Work iii”, is also an experience in itself. Tómas Saraceno born in 1973 in San Miguel de Tucuman, Argentina, was awarded the Calder Prize in 2009 and he lives and works in Berlin. Trained as an architect, he is not only an artist but an environmentalist and he combines engineering, physics, chemistry, aeronautics and materials science in his work. Saraceno has had solo exhibitions at the Barbican Art Gallery, London, Berkeley Art Museum and Pacific Film Archive, University of California, Hangar Bahnhof, Berlin, etc. It is an interesting fact to note that Saraceno holds a World record for the first, longest, fully solar-powered, certified, lighter-than-air vehicle tether Flight. He is present at Calder Prize exhibition with “Cumulus Filaments”, 2016 and “Trace G64 B213”, 2015. The exhibition is open to the public up until 5th of March, 2016 at PACE LONDON. The art scene in Paris has long been recognised, first and foremost, as the birthplace of Impressionism with the likes of Manet, Monet and Degas bringing it to global prominence. Today, however, Paris’ modern and contemporary offerings are a strong and exciting force driving its reputation beyond the die-hard, 19th century roots. From cutting-edge industrial architecture in the Gagosian Le Bourget, to digital innovation at La Gaîté Lyrique, we rounded up the 10 best modern and contemporary galleries to give you an insight into the city’s burgeoning arts scene. In a nutshell: The rugged concrete interior may appear to be a meditated aesthetic decision but was actually due to the the gallery’s lack of money in the middle of renovation which led to organisers leaving it in its stripped-down state. Situated across from the Musée d’Art Moderne, the enormous Palais de Tokyo space houses some of the most cutting-edge, contemporary art in Europe including mind-blowing installations, films, and performances that are always exciting and immersive. Don’t miss the excellent bookshop and The Toyko Eat, the gallery’s restaurant. Where: 16th arrondissement. Open 12pm-12am every day except Tuesday. 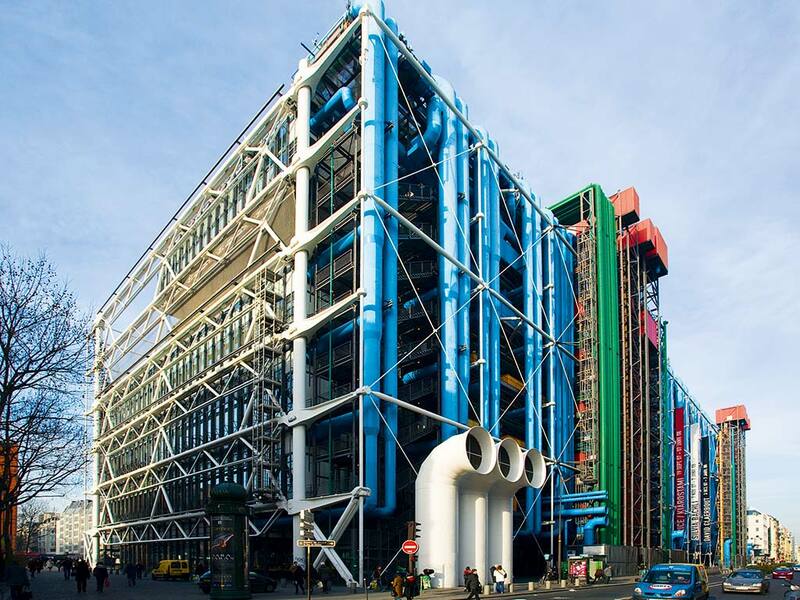 In a nutshell: The base level for any contemporary art-goer in Paris is the Centre Georges Pompidou, its name pays homage to its creator – the French president – who commissioned the building in 1969 as a completely new, multidisciplinary cultural centre. It’s architecture is an extraordinary mélange of multicoloured pipes forming a structure that juts out from the traditional French buildings of the 4th arrondissement. With its exhaustive permanent collections of modern and contemporary art spanning over 100,000 works including Pollock, Kandinsky and Man Ray, the Pompidou is, unsurprisingly, one of the most visited museums in France. Don’t miss the panoramic view from the top floor and the gallery’s library. Where: 4th arrondissement. Open 11am-10pm everyday except Tuesday. In a nutshell: Like the Palais de Tokyo, La Gaîté Lyrique is hyper-contemporary. It focuses on the digital arts, complete with a video game station, interactive library and café, as well as exhibitions in the basement. The institution embraces all forms of contemporary digital expression from cinema, web design, and visual arts to electronic music. You’ll find many students in the café, teens playing the video games and plenty of families who take advantage of the kids afternoons the gallery holds during its exhibitions. Where: 3rd arrondissement. Open 2pm-8pm Tuesday-Saturday and 12pm-6pm Sundays. Closed Monday. In a nutshell: Located in the East-Wing of the Palais de Toyko, the Musée d’Art Moderne has been running since 1968 with over 10,000 modern and contemporary works from both European and global artists as well as several temporary exhibitions each year. The gallery was briefly closed in 2010 after a theft of over €100,000 worth of masterpieces, including works by Matisse and Modigliani. Even with its compelling heist history, the gallery is not as well-known as its name suggests, but is still worth a visit for its excellent permanent collection. Where: 16th arrondissement. Open 10am-6pm Tuesday-Sunday except Thursday with a late opening until 10pm. Closed Monday. In a nutshell: Situated on the edge of Paris’ Place de Concorde in the famous Tuileries Garden, the Jeu de Paume is a beautiful 19th century building that once served as a tennis court, (hence the gallery’s title – ‘Jeu de Paume’ is French for racquet), as well as a sorting house for Nazi loot during WWII. The work on display, however, often goes above and beyond the building’s history with a focus on exhibiting post-war mechanical/electronic art – predominantly photography but also includes cinema, video installation, web art and more. Its major exhibitions, such as the current showcase of Philippe Halsman’s famous celebrity portraits have made it a popular destination for the city’s art-goers. Where: 8th arrondissement. Open 11am-9pm Tuesday and 11am-7pm Wednesday-Sunday. Closed Monday. In a nutshell: Housed in an ex-hotel in Paris’ historic 4th quarter Le Marais, the Maison Européenne de la Photographie is an institution dedicated to showcasing contemporary photography with a collection of over 20,000 works as well as rotating exhibitions which show anything from portraiture to optical illusions. Each rotation gives a broad vision of photography today, recently showing a major exhibition documenting a season at French fashion house Lanvin, as well as the remarkably composed architectural photographs of Caio Reisewitz. As well as these spaces, the gallery houses an auditorium, library, and video viewing facility and runs workshops and events throughout the year. Where: 4th arrondissement. Open 10am-8pm Wednesday-Sunday. Closed Monday and Tuesday. In a nutshell: Describing itself as having an “original approach to corporate philanthropy”, the Cartier Foundation commits itself to raising public awareness for contemporary art by exhibiting established artists as well as offering younger ones a chance to debut. Housed in a glass building designed by Pritzker Prize architect Jean Nouvel, it sits in a tranquil woodland garden, landscaped by Lothar Baumgarten making it a worthwhile place to visit for reasons beyond just the art. As well as organising multiple exhibitions, the foundation has created ‘Nomadic Nights’, an event focusing on the linkage between different kinds of contemporary expression via the performing arts. Where: 14th arrondissement. Open 11am-8pm Wednesday-Saturday and 11am-10pm on Tuesdays. Closed Monday. In a nutshell: Major player in the contemporary art world, Larry Gagosian has fifteen galleries worldwide including two in Paris; one in the north-eastern suburb Le Bourget and another in the 8th arrondissement. The former is in an industrial park of Le Bourget, its location enabling the gallery’s spacious interior which, like Paris’ Cartier Foundation, was designed by Jean Nouvel. Indeed, the building is an extraordinary work in itself, combining the rugged industrial original with a smart contemporary finish. The latter is a smaller space than its suburban counterpart but is exceptional nonetheless, set in a Parisian mansion just off the Champs-Élysées. Expect a vibrant contemporary art program featuring leading international artists. Where: 8th arrondissement. Open 11am-7pm Tuesday-Saturday // 93350 Le Bourget. Open 11am-7pm Tuesday-Saturday. In a nutshell: Paris’ size to population ratio has always been pretty tight and is one of the reasons why many large public spaces lie just outside the Périphérique dual-carriageway that defines the city limits. One of the many exciting contemporary art centres in the suburbs is Musée d’Art Contemporain du Val-de-Marne, a.k.a. MAC/VAL. Situated in the south-eastern suburb of Vitry-sur-Seine in a sprawling contemporary building, MAC/VAL boasts being the first museum completely dedicated to the French ’50’s art scene. Having now expanded its collection to house everything from the ’50’s to contemporary art, the gallery also enjoys exhibiting both experienced and up-and-coming artists. Where: 94400 Vitry-sur-Seine. Open 10am-6pm Tuesday-Friday and 12pm-7pm on Weekends and holidays. Closed on Mondays. Tonight marks the launch of London’s first ever festival of light, Lumiere. In a few hours time, when another long shivery evening will fall over the capital, a multitude of installations – some impressive and spectacular, others intimate and mysterious, all of them dazzling with light – will illuminate many of London’s well-known landmarks. Places like Westminster Abbey, Piccadilly, Oxford Circus, Trafalgar Square, Leicester Square and various sites in Mayfair and King’s Cross will be adorned, transformed, and made strange by the inventions of leading artists, art collectives and design studios from all over the world. The festival originates in the city of Durham, where creative producers Artichoke have staged Lumiere Durham biannually since 2009. Durham locals have grown both accustomed and attached to their beloved festival and might not feel that enthusiastic over its move to the capital. Luckily there’s plenty of art, love and light to go around which is why I’d like to give a taster of some of my favourite Lumiere London pieces, all of which you can expect to encounter every night after dark until Sunday 10:30 pm. The purpose of Lumiere is to bring joy to the streets of London at a time that is infamously miserable and generally marked by debts, depression and darkness. To this end, Portuguese collective Ocubo has created an amazingly cheerful piece: an imaginary circus, staged with 2D and 3D light projections on the side of Central Saint Martin’s Granary building. Inspired by local school children’s drawings that tell the stories of classic circus characters, Circus of Light will make you jubilate with delight over a burlesque and playful light show filled with jolly tricks and capricious stunts. Accompanied by a hilarious soundtrack, the piece is guaranteed to put a smile on your face. On King’s Boulevard you can get involved in literally painting the town red – as well as every other colour. The ingenious technology of Stockholm based arts production company Floating Pictures allows you to colour the asphalt with either the torch on your smartphone or one of the gigantic glow sticks handed to you by the lovely volunteer on site. I’ve had the chance to preview the Light Graffiti, and trust me, it’s so fun you’ll find yourself embarrassed to have made those children queueing behind you wait so long. Less merry and lively than ghostly and entrancing are French-Korean artist Tae gon Kim’s dazzling Dresses that you’ll find along this street as well as Stable Street. These beautiful shimmering LED gowns look like eerie shells encapsulating invisible phantoms, frozen elegantly as if on their way to a fairytale ball in some wondrous different dimension. You’ll find a final glamorous guest trapped in a Liberty shop window over on Regent Street. Meanwhile, at the bottom of Regent Street, a character appears that will definitely stand out from the crowd: a majestic 3D elephant, which – projected onto the canvas stretched inside the Air street archway – will emerge from a cloud of dust stomping and trumpeting its way into its strange new surroundings. Created by the studio of French artist Catherine Garret, the Air Street Elephant echoes Artichoke’s very first intervention in London in 2006, when it paraded Royale de Luxe’s 20 feet high The Sultan’s Elephant through its streets. Lumiere allows a myriad of other animals to invade the city environment, from Sarah Blood’s songbirds hidden in twelve illuminated cages in Brown Hart gardens, their presence only betrayed by their song (which, I can reveal, is actually produced by people) through to neon balloon dogs à la Jeff Koons on the Strand. Finally, tropical fish feature as dreamlike silky sculptures swooping through the Piccadilly sky, and, over in Mayfair, they swim around in a London telephone box, leading you – once you grasp the odd redeployment of the familiar red object – to dream of tropical travel and an escape from everyday reality. Creating a temporary alternative to the urban everyday – the daily bore of making a living, commuting, working and so on – is one of Artichoke’s key aims. So beyond the purpose of lifting people’s spirits – although entirely worthwhile in and of itself – Artichoke’s projects intend to radically reimagine the purpose of a city. They question what a city’s spaces can hold, and who they are for. What can they accommodate other than the perpetual movement of people and products, the smooth flow of funds and vehicles? How many streets and tube stations can be closed in order to momentarily create a pedestrian playground and give the streets buildings and infrastructure over to dreamlike shapes and figures, imaginary performers, liberated animals? Reinventing a city as a large-scale outdoor gallery, a canvas for the imagination of both artists and the public, Lumiere disrupts the productive routines that characterise world capitals across the globe.. and it makes for a very worthwhile spectacle. Make sure to enjoy it while it lasts, from tonight (Thursday) through to Sunday night, 6:30-10:30 pm. Europe is a major topic of discussion, now in the eye of the refugee crisis, more than ever. Some people are scared and see the challenges Europe is confronted with, while others are more optimistic and focus on the bonds and the cultural roots European countries share and see this as a chance for European nations to grow closer together. The Victoria & Albert Museum has always had a special role in conveying European history to the public. Therefore, it assumes its role once again now with the opening of the new Europe galleries Europe 1600-1815. These are a continuation of the Medieval and Renaissance galleries that lead up to 1600, and whereas the galleries from 1600 to 1815 have existed before, they have not been renovated since the 1970s. Therefore, the museum decided that it was time to do so. This was a major project that lasted over five years and was sponsored by the Heritage Lottery Fund and private funds. Architects ZMMA made a great job in opening up the gallery space and giving the ceiling its original height back, as well as providing more gallery space for the exhibition, by taking back the attached rooms that were previously used for storage. The lead curator for this permanent exhibition is Dr. Lesley Miller and she and her team of restorers, conservators, curators and technicians did an incredible job. When you walk through the seven galleries you immediately sense that you are in an old historic building, but in very modern rooms. Every transition, from one work to the next and from one room to another, is smooth. The large windows are blocked to not let sunlight in, but the artificial lighting is efficiently pointed towards those objects the curators meant to lead our attention towards. There are little leather sofas scattered around the exhibition for visitors to rest once in a while, again, strategically positioned in front of particularly important work. The gallery compromises seven rooms in total, most are long galleries and each one is in a different color and in periodic order. The room in the middle is round and allows a natural short break before visiting the second half of the exhibition. Additionally, you can find some smaller rooms attached to the sides of the galleries, which show us dressing rooms and bedrooms from the time. These are beautiful and richly decorated rooms, entirely reconstructed the way they used to be. Room 7 is called Europe and the World, 1600-1720 (the one highlighted in the V&A above), but it is chronologically the first room visitors enter after having visited the Medieval and Renaissance galleries. It is also the first room you see when entering the V&A through its main entrance. Its walls have a deep purple color and it demonstrates to what extent Europe at the time was shaped by trade, colonization, and religious conflicts. It also touches upon the regions colonized by major nations like Portugal and Spain. Room 6 is the second room and it is called The Cabinet and displays collections of all sorts of objects that people at the time collected. Room 5 is called The Rise of France from 1660 to 1720 and contains objects and paintings related to French society, culture and, of course, politics. Particularly memorable here is a very large painting that required seven people to hang it onto the wall. It shows the gardens of a castle designed by the architect of Louis XIV; it is incredibly detailed and it is one of the few objects the V&A acquired while renovating the Europe Galleries, whereas most of the objects were already in its collections. Room 4 is the above-mentioned room, the center room of the galleries, round and connecting both long corridors of galleries with each other. It’s main content is a specially commissioned artwork called The Globe, which serves as a space for meeting, discussion and debate. It is also the Enlightenment room; during this time the Enlightenment emerged in Europe and, for example, a controversial Encyclopedia intended to encompass all human knowledge was published. Various objects relating to this theme can be found around The Globe. The second-to-last two rooms are called City & Commerce and cover the time period from 1720-1780. Following the French Revolution, wealthy Europeans started enjoying a less formal way of living. During this time, artists and designers developed the Rococo style. Catholicism plays an important role during this time and thus these rooms contain several historic objects from churches. The last room is called Luxury, Liberty & Power, 1769 to 1815 and it is dominated by Neoclassicism, inspired by the then recent discoveries of ancient Greece, Rome, and Egypt. Here, France and the French Revolution play an important role, as well as Napoleon’s rise to power, as both movements used the arts to promote their cause. These galleries are an absolute must-see and on Monday the V&A’s Director Martin Roth hosted a roundtable in honor of the opening of Europe 1600-1815 so stay tuned to hear more about it! But you absolutely have to go see the galleries for yourself.